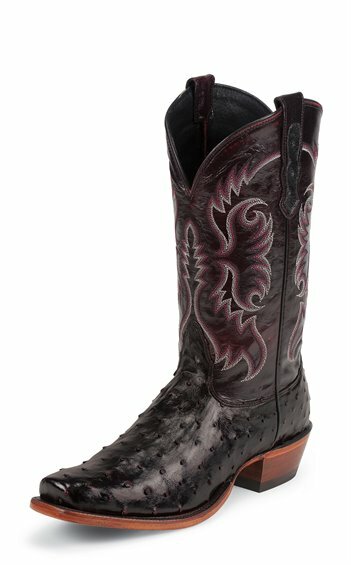 The Conway Full Quill 12-inch tall men's exotic boot is sleek with a polished black leather exterior accented by a cherry, silver, and white stitching along the upper. The glistening black full quill ostrich foot and matching diamond cut pull straps are subtle details that set this boot apart. Its square toe and unit heel that allow for an easy fit in the stirrup and the cushioned insole provides support for lasting comfort throughout the day. This style is proudly Made in the USA with global parts.